On Friday I got up early and headed for the office. It was raining, and when I reached my office the parking lot was covered in water. As I entered the parking lot I pulled over to the side, and weighed my options. I could park my car at the far end of the parking lot and walk through the water to the door of my office, or I could drive through the parking lot to the higher ground near the door to my office and walk in. I didn’t realize how deep the water was, since in the ten years I’ve worked from this office I’ve never witnessed a parking lot flood. I decided that walking through the water made no sense, so I put my car in gear, and made the fateful decision. I would floor it, in the hopes that my forward momentum would get me through the water before my car stalled. I gunned it, but as I drove the forty feet to my destination my car started to lose power in the water, and as I hit a submerged speed bump, my car stalled. I waited a minute, and I was able to restart the car, but the transmission wouldn’t shift into drive. I considered my options again, and realize I was stuck until the water receded, I opened my car door. The water was up to the bottom of my door. Realizing it would probably take an hour or two for the water to recede, I took off my shoes, took off my socks, rolled up my pants, grabbed my briefcase, and walked the ten feet through the water to my office door. I own the company, so I’m sure the thirty employees in the office that day had a good laugh watching the boss get his car stuck in the water, and then walk in to the office barefoot. Apparently the rain fell so quickly that the sewers were backed up, and the water was coming up from the storm sewers, and hence the flood. Had I been more observant, I wouldn’t have attempted the river crossing. Two hours later the water had receded, and I was able to start my car and drive it to higher ground. Unfortunately by then the damage was done. The engine made a grinding noise, and even though I’m no mechanic, I knew that was not good. I had the car towed to the local dealership, and two hours later they called me with the bad news: Water damage in the engine, and the simple answer was that the engine needs to be replaced. Later that evening, after my wife, who clearly has more knowledge of these matters than I do, informed me that the proper technique for driving through water is to drive slowly, which of course is the exact opposite of what I did. I thought that driving fast would give me the momentum to make it through the water. Instead, driving fast only served to drive the water deeper into the engine, which is what caused all of the damage. So, today’s advice: drive slowly through the water, or avoid it entirely. That’s probably good advice on the markets as well. If you listen to the happy talk on TV, there are no puddles at the moment. Everything is great. Over the last month the markets are up. 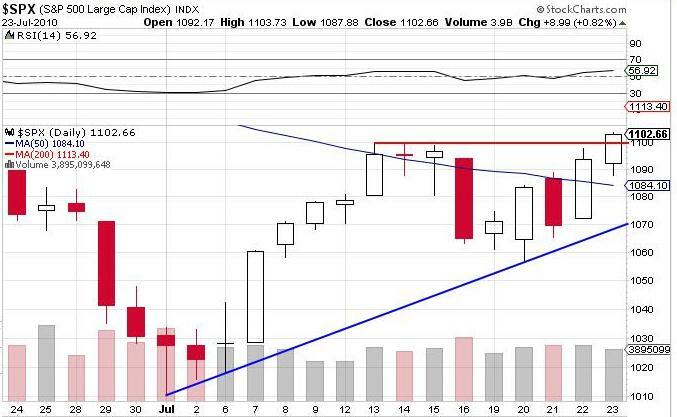 As the chart shows (click on it for a larger view), from the bottom on July 1 the market is in a beautiful uptrend, pausing down to the uptrend line on July 20 before breaking out to new monthly highs on Friday. On Friday the S&P 500 bounced over it’s 50 day moving average, and is now less than 11 points below the 200 day moving average. 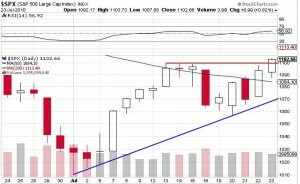 And, finally, the S&P 500 closed at 1,102 on Friday, which is the first time this month the S&P 500 has eclipsed the 1,100 level (it tried on July 13, 14 and 15 to get over 1,100 and couldn’t), so getting over 1,100 is both technically and psychologically important. Of course, cynic that I am, I take the alternate view. We still also have the matter of the “lower lows”, the red lines, including the July 1 intra-day low of 1,014, which easily broke the previous low on the year of 1,056 on February 8. The chart also shows that volume is not picking up, so this continues to appear to me to be a thinly traded market; the Big Boys are propping it up with little effort, and the rest of us are along for the ride. All it will take is some jolt of bad news to pop the bubble. The market started the year at 1,115, so that’s the level needed to get back to positive returns for the year. 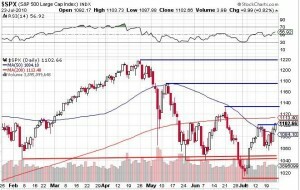 If these levels are taken out, we could easily see the market run up to the 1,200 level or higher. 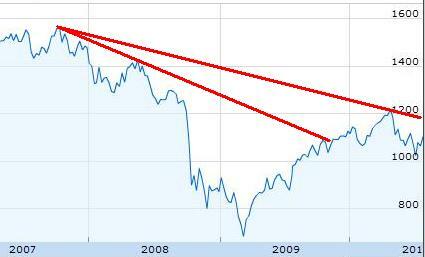 A move above 1,200 quite obviously breaks the down trend line, and at that point, who knows. However, until we get above 1,115 the S&P 500 is still down over 1% on the year, which is obviously not a characteristic of a bull market. a really screwed up housing market, despite some small signs of good news. First, I’ll watch the market early in the week, and if it looks like the bounce up will continue, I will close out my August S&P puts at a substantial loss. Second, if, when my car gets out of the shop later this week with it’s new engine, I encounter any large puddles, I will drive slowly.